On Thursday I got a call from my new OBs office saying that they had to cancel my appointment to meet with the office PA (to go over paper work and talk about history) on Tuesday, and I let them know that Tuesday immediately after the appointment I was leaving for a friend's wedding and would be out of town for a week. Thankfully, they managed to squeeze me in on Friday (actually the entire office was empty the entire time I was there, which made me wonder if they have patient in on Friday at all). Apparently things are quite busy at the moment though, so the soonest they could fit me in for an actual appointment to meet my OB was on September 20th, which will be at 33 weeks. There seemed to be some shock at all the tests that hadn't been done, and I got the feeling that in this new office women aren't asked about all the rounds of prenatal testing, but that it's just something they tell you you're going to do. At my previous office we'd never talked about doing the twelve week tests, and my doctor with Mae had told me when I asked that if I wasn't going to consider an abortion if there were problems then there was really no point in doing them and so not having them done hadn't bothered me at all. Here apparently it's odd that I hadn't had "any sort of testing for genetic abnormalities?!?!?" The staff was very friendly, I just have the distinct impression that they're used to having every single test run for every single mother. I've also realized that my expectations for OBs are rather low, as I began to think of what I hoped my doctor would be like and found that the wish list was something like: I hope he's not insulting. I hope he doesn't spend the entire appointment being a condescending jerk. It would really be nice to have someone who can make it through an entire appointment without throwing out jabs about how dumb I am not to go on the pill. I hope he doesn't ask if I'd like to be sterilized every time my husband is out of the room. And it would be nice if every single person I talk to post-partum doesn't grill me about not being on the pill. Maybe I can ask them to make a note about it this time in my chart. Because I find my temper growing shorter and shorter when it comes to all the pressure they put on moms who've just gone through childbirth to start pumping their bodies full of Class 1 carcinogens, just like I think it's disturbing that they ask a mom in the third trimester whether she's not sure she doesn't want them to go in and tie her tubes while they're doing the c-section (it may be one thing if the mother suggests it, but suggesting it to someone who's in the midst of swollen feet and an aching back seems like a recipe for regret...). I guess I'm a bit pessimistic when it comes to doctors in this field. I know that there are wonderful OBs out there. And to be honest, one of the hardest parts about leaving Florida was knowing that I was leaving my NFP OB... I'm just skeptical about the chances of finding a good one right now. Because in my experience they're few and far between... And the "experts" who think I'm a brainless idiot for actually adhering to and embracing my religion's teachings abound. Yup... looking forward to that appointment on the twentieth... I'm really not usually this pessimistic! I hope that, at the very least, I have a doctor who doesn't make me worry that they might just go ahead and tie my tubes without telling me, because they're so contemptuous of the idea of another pregnancy. With certain doctors, the combination of God complex and contempt for people who have more than two children, have caused such paranoid thoughts to abound (because I totally could see someone like Mr. Make-Fun-of-a-Mom-Who's-Just-Miscarried doing something like that if he thought he could get away with it...). Or maybe I could use the embroidery feature on my sewing machine to make one that says: "Please Stop Pushing the Carcinogens... My Answer isn't Going to Change... No Matter How Many Times You Ask..."
If this doc is a problem, I recommend calling your parish office and asking if they know of anyone they'd recommend or speaking to some of the women with small children at your parish and asking them if there was anyone they'd recommend. I imagine it might be difficult being as "new to the neighborhood" as you are, but I've found 6 awesome pro-life OB/GYNs all through asking other faithful Catholic women. Our biggest problem so far has been finding a doctor that accepts our insurance. I called four offices before I found one, out the forty or so doctors in the practices, that would take me. It's hard finding NFP doctors. We only have one in our state (New Mexico). Luckily the OBs I have had have been very nice about me always declining BC pills. And also nice when I get pregnant again soon hehe Although they know nothing about NFP and whenever I mention my chart, I get totally blown off. (Even when my chart indicated a problem, they would not run bloodwork). Next time I really want to try a midwife. My last son was born so fast, the OBs were all busy when we got to the hospital, so they called the on call midwife and I loved it! I am not sure if my insurance will cover a midwife for prenatal care though, I still need to look into that. 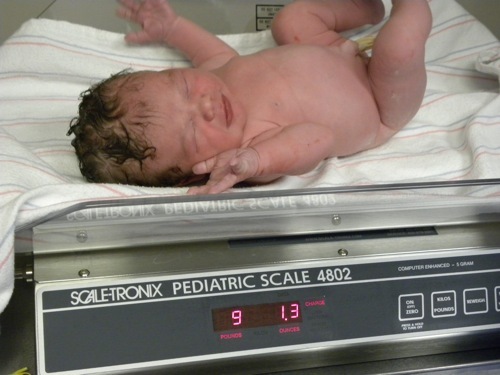 Would midwives be an option for you even thogh you've had c-sections? My favorite joke about doctors is that they all believe in God, but most are surprised to discover that they are not Him! Insurance can be such a problem, but that's another whole discussion. Here's hoping and praying that you have a good experience. It really stinks how much we have to fight for what we want in terms of our health care. I would second the idea of looking into a midwife or doula too. They can be great advocates for you and tend to be more crunchy and therefore less inclined to promote contraception. Good luck! Does your insurance offer a feature online where you can search doctors? Ours does that and it can be very helpful! Also, pray for the right doctor and ask God to make it obvious! I will pray for that for you. He set the perfect doctor for me in front of my face at the end of a really lame hospital tour. She spent 30+ minutes talking to me after asking me if this was my first and seeing my tears when I responded with "No." They don't look at me like I'm crazy when I say I won't be using BC and they are totally on board with the fact that we are educated and will make decisions about medical stuff, not just follow along like little ducks. I simply told my doctor, the last time he asked if I wanted to go on Birth Control, "Oh, honey, I'd never put you out of business like that." He got a good chuckle out of that. He still reminds me that the option is there if I change my mind. And it's true, technically the option is there - legally - It's just not an option for me. I'm not going to fault him for covering his own derriere, lest he be sued by someone who claimed they didn't want Birth Control at some point and then decide they should have been given the option the next time they find out they're pregnant at an inconvenient time. Rather than worry that the topic of The Pill or sterilization might come up, why not state at the outset that you you follow Catholic teachings and don't need to discuss those options? If the doctor's alerted to your values he/she may drop it. I guess I'm suggesting a proactive approach. Ironically enough, it was the natural-minded, crunchy midwife after my 3rd baby that gave me the most 'grief' about not using birth control (using NFP). I wouldn't say she gave me grief so much, as she just acted REALLY SURPRISED that I didn't use birth control. At the 6 week check-up she asked if I wanted birth control and when I said "no, we use NFP" she was all "really, that works for you???" She just didn't seem to believe that someone of my education-level and intelligence and child spacing (my 2nd and 3rd were over 3 years apart) would not use birth control. With each of my first two I used a regular, mainstream OB (not the same one) and when they each asked about birth control at the 6-week check-up, and I said "no" they just said "ok". The OB I used with my 2nd, even replied with a "good" to that question. Of course, maybe he just wanted more business. ;) And, these were not pro-life doctors or NFP doctors at all. Now, I'm using a midwife again, so we'll see what happens when we get to the 6-week check-up, but I don't expect her to give me any grief. 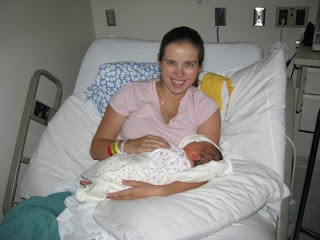 With one of mine (I can't remember which one, probably the 3rd) I do remember the nurse or someone asking at the hospital if I ended up with an emergency c-section, did I want my tubes tied at the same time. I just said "no" and that was it, no one pushed it, and I think they only asked with one of mine, but I don't really remember that well, since I was in labor at the time. And it's that conversation that leads to being made fun of and ridiculed, after hearing that I'm Catholic and (shock) follow the Church's teachings. That's how it comes up. And then they don't drop it. They bring it up at every. single. appointment. Because they seem pretty sure they're going to change my mind and somehow convince me that I'm letting my body oppress me. Yup... it says Catholic at the top of my chart. And I've had the conversation. Hasn't changed a single thing yet (except to bring on an air of contempt). I've had four kids with three different OBGYNs, and I've never been pushed to take birth control. The very most that's happened is that at my 6 week postpartum appointment, the doctor asks if I want to talk about contraception. I say, "No thanks." And that's that. It's certainly never come up while in the hospital immediately after delivering! Good Lord. Maybe because I've always breastfed. You've lived in some places with really rude doctors! I hear kind of the same thing from people who say doctors and nurses pushed them to circumcise their baby boys. For me, I've not only never been asked about it, but was applauded by the nurses and doctors for choosing to leave my son's body in its natural state. I guess it just depends on the hospital! I think Bethany may have a point, they don't always want to push BC on you but want to make sure they've done their due diligence in making sure you're fully informed of your options. Still, the pushiness just doesn't make any sense! It seems so much more productive to start the conversation with "what are your plans with regard to future fertility?" or something more open-ended like that. If the patient isn't sure, THEN it would be appropriate to open the box of options. Otherwise...just assume your patient is intelligent enough to know her own mind! I'm just totally shocked that so many OBs out there would be offering/encouraging BC pills without first asking if a woman is nursing. The estrogen/progesterone "combination" pill isn't compatible with breastfeeding at all, both for the baby's safety plus it dries up your milk, and while the progesterone only "mini" pill is supposed to be safe for the baby, it also tends to have a negative effect on milk supply. My OB has never gotten farther down the path of do you want BC than asking are you nursing - which has always been true until the next pregnancy dries up my milk - I don't seem to be able to be more than a few weeks pregnant and still have any milk at all, although I know plenty of women who nurse through an entire pregnancy. And just to throw it out there, though I would never terminate a baby for any reason, or have a dangerous test like an amino done, I have always done the 12 week tests, since I figure if there were indications of something like downs I would know to insist that a neonalologist was present at the birth in case of complications, which would be more likely - this is not standard practice at the large hospital where I deliver. Sadly, the twelve week screen is where we learned last month that our fourth child had passed away some time in the previously week. 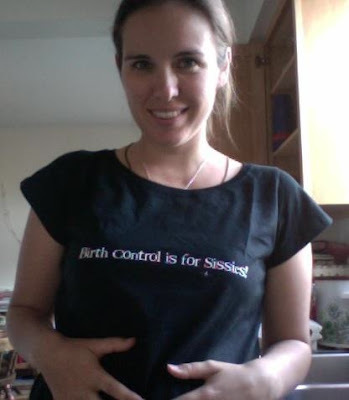 One thing that I do want to comment on though is that I'm not a fan of your "birth control is for sissies" t-shirt. The reason is, my parents were advised by a priest that they could use certain forms of birth control, so they decided to stop at 3 children. My dad has a serious mental illness and I know my parents only had the family's best interest in mind. They did seek counsel of the Church, but it wasn't good counsel. But I always wanted more siblings - I've even grieved over a third sister I thought we should have had, and the brother I'll never have. I guess I'm just saying, my parents used birth control - as many people do - and aren't sissies, as many other people aren't. I just wanted to say that because I cringe every time I see the photo in a post. No offense meant, I just wanted to share that with you. I'm sorry you don't like the shirt (and I'm sure lots of people don't, I got tons of comments from friends on facebook letting me know they're not fans either). It is meant as a joke. As someone who is a convert, pretty much all of my friends are on the pill (and I contracepted before my conversion), so I'm well aware of the wide variety of reasons. It is very sad that so many were led to believe the Church taught something that it didn't... and I'm equally grateful that at this point there's no reason a Catholic who is seeking the truth shouldn't know that it's wrong. The shirt is meant to make people think that the pill shouldn't be the status quo and that there are different options. And there is quite a bit of truth to the fact that a lot of people do avoid parenthood these days simply because it's represented as difficult. Usually it elicits a chuckle rather than a cringe. 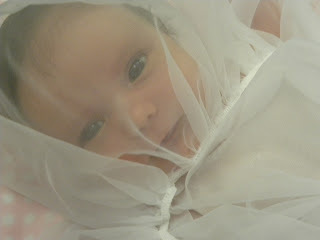 May I ask why your baby's face covered with sheer fabric in that photo? I've never seen that look at a baptism before... and I'm the baptism coordinator at our parish! Oh also, I think your shirt is funny, although I am not personally comfortable wearing stuff with controversial slogans. I do think it would be a hoot if you had a really good Pope JPII t-shirt and wore it over your expanding abdomen! I think it would get the same point across (openness to life) without the controversial and (possibly taken as insulting even though I know you don't mean it that way) slogan. That picture idea was one we snapped when we were changing Sadie after her baptism and she started playing with the slip... and we loved how it turned out so much that we copied it with Mae (who I think that picture is of! ).